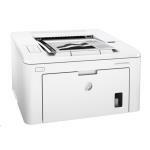 HP LaserJet Pro M203DW Expert Reviews - Read Reviews and Buy Smarter Online. Verdict: Laser printers are still one of the stalwarts of small and home offices, particularly when colour print isn't required. HP's LaserJet Pro M201dw comes in at comparatively low cost, while still offering a good feature set and a well-balanced specification. Verdict: I bought this printer because I am doing high volume black & white printing and I didnt want to keep using my color printer and that expensive ink.Sine I do not have a CD Rom drive, set up was a bit more difficult as i had to navigate to the website. Printer arrived as promised - on time, well priced and well packed. Verdict: I have been looking for a network printer for sometime and this HP Laserjet Pro M203dn A4 Mono Laser Printer ticks all the boxes. I love the fact that all my devices are able to print to it. Duplex printings also another feature I was looking for, and yes this printer does all this. Verdict: The transaction with Amazon was great. I wish I could say that about this printer. In my 25 years of IT, I have not seen an HP printer this bad. I bought two at the end of October, one is dead already and the other has consistent problems. Wireless connections are intermittent at best. Verdict: Needed inexpensive laser printer with auto-duplexing feature. This fit the bill. Only drawback was had to call OD tech to find out how to turn the auto-duplex feature on in settings. Luck for us Patrick knew where to go to do so in about 4-5 minutes of phone time. Would buy again. This is a neat, compact and lightweight printer. Verdict: I found this to be a fairly easy to set up printer which works from both a Mac and a PC. The first printed sheet seems slow to emerge but after that output is fine. This may be related to my router more than the printer itself. Verdict: Printer is good and quite nice with all the printout except the price of ink are too high , the price for 4 ink are more expensive than the printer. Not recommend to buy unless you are prepare to buy expensive ink, regret buying for me. Great printer. Does everything it promises. Verdict: I have had this printer for over one year and I couldn't be happy. I use this printer as my private printer at home and the introductory toner that came with the printer still works after 230 prints ( warning message appeared last week saying toner is very low). Verdict: Very quick compared to my previous printer and double sided works well. I like the Ethernet connection (no wifi password problems!) and the way the paper tray doesn't stick out. Verdict: I was looking for a solid monochrome laser printer for occasional home use. An IT colleague suggested looking at HP printers as his experience has been that HP's were more reliable than other brands. After using this printer for a couple weeks, t has proven to be everything I need in a home printer. Verdict: Good simple BW printer. A bit of a pain to setup the wireless, but take your time and download the wozard software and it works. Verdict: Bought this on sale. Fantastic value for a surprisingly good quality printer. 2 things to watch though; I have only had it for a month so the durability and long term quality are yet to be determined. Second and VERY IMPORTANT, it will not install correct if you have the latest version of WIN 10. Verdict: Good quality prints. Easy installation of toner cart and double sided printing works well. Pleased with this product. Verdict: Outstanding printer. I had it out of the box and up and running in 15 minutes. I used a direct wired connection to the internet, not a problem. One laptop, one desktop, one ipad and one android tablet all print. So far, could not be happier. Highly recommended. Adorama was great. Verdict: Great entry-level business printer with solid build, strong printing and good durability. Verdict: Brilliant for home office or a small business. Really easy to set up and extremely cost effective. Neat, compact size and quiet function. Love it! Verdict: Overall experience was excellent. Price was very competitive and delivery done much ahead of time. Pros: First page comes out quickly. It's not that hard to set up for Linux. Unlike older models, the setup software from HP works, and there's no need to do much manual configuration. That said, if you need to set it up manually, a USB cable can be used to configure it. Verdict: It's not one of the good old HPs, but, for a newer, lightweight printer, it's good. This is suitable only for low-volume printing. Verdict: This printer is excellent. It is great quality and priced at a decent amount. I couldn't have asked for a better printer. HP is a great brand as well.